Have you thought about a leather collar for your dog? Those not only look nice, they also hold up against everyday use. Every time you take your dog out, you use a collar. If your pet gets lost, it will help them get found. When you’re training, grabbing by the collar happens a lot. It is the most essential item of dog ownership. Unless you’re using a dog harness, you’ll need one. That said, you might not want to buy the cheapest one. A nice dog collar is a classy look. They’re durable, aesthetically pleasing, and comfortable. We’ve reviewed many so you can choose the best! 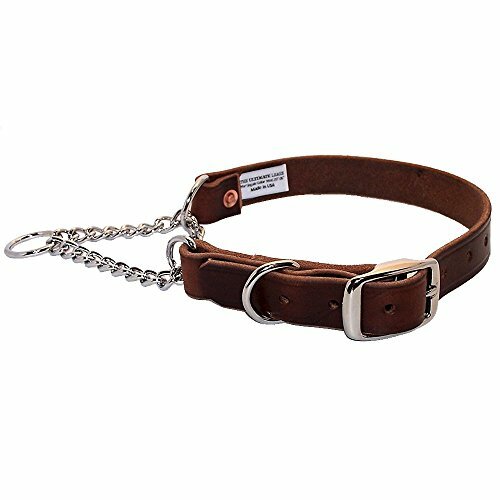 Neck Size: 15" - 18.5" | Width: 1.25" | Length: 25"
This real full-grain leather dog collar is designed for comfort and durability. With a padded inner layer, this collar provides extra comfort. This keeps your dog’s neck from becoming irritated or inflamed. It’s made with extra durable stitching. This holds it together well. It also keeps it from shrinking. The tanned buffalo hide leather is designed for minimal stretching. It’s made with sustainable tanning methods, so no harsh dyes or chemicals are used. It will never be toxic to or harm your dog. It comes in four sizes, ranging from 8.5-28 inches. You can choose regular, braided, or embroidered. These come in either brown or black. There’s also a brown option with an Aztec pattern. It has one large brass D-ring for leash attachment. The small one is for tags. It’s a quality, comfortable choice that will last. 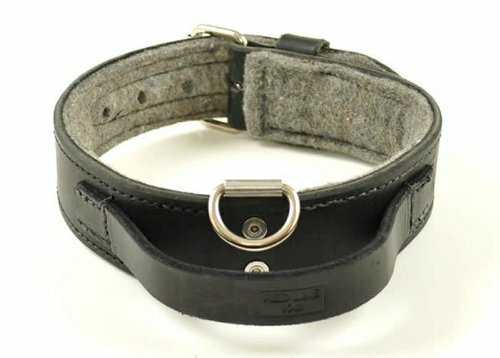 This collar is made of full-grain, eco-friendly leather. The natural tanning process uses no harsh dyes or chemicals. You can be sure this is safe for your dog. It’s made with sheepskin, which is both comfortable and durable. It’s designed to stay dry, stain and smell-free. The smell-free material offers a non-corrosive quality. Therefore, it’s long lasting. It comes in 4 sizes ranging from 11-25 inches. You have some color options. They are two-toned, with the outside color in black or tan. Choose from light pink, coral, teal, and turquoise on the inside. In addition, the Capri Collection comes with gray, pink, and turquoise exteriors. They come with two brass rings. The small ring near the buckle holds tags. The large D-ring is for attaching a leash. As far as dog collars go, this is a great option. This affordable collar for dogs offers functionality and style. It’s available in a number of different colors. Choose from blue, navy, green, pink, purple, red, or yellow. In addition, it also comes in classic black and brown leather. It’s made of leather and alloy. There is a single D-ring which is nickel plated. It’s placed to reduce rubbing on your dog’s neck. Therefore, it’s comfortable. It comes in 5 sizes ranging from 8-22.” However, there have been mixed reviews on durability. For the price, a replacement after wear-and-tear isn’t a stretch. 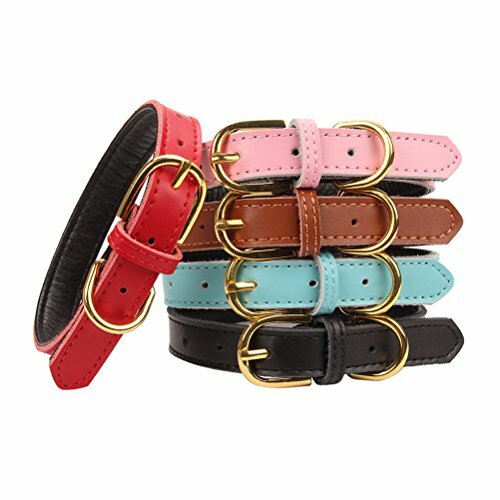 This is a colorful, well-priced leather collar for dogs. This collar is crafted from brown skirting leather. This is premium, high-grade leather. Many dog collars don’t have this quality of leather. Combine this with its fashionable design, and you’ve got a quality pick. In addition, this leather is both fade and rip-proof. This is a great option for active dogs. For instance, it’s built to keep from rubbing and irritating your dog’s skin. These qualities drive the price up. However, this stunning design is hard to beat. Length ranges from 13-25.” However, they work best for large breeds. They run big, so aren’t suitable for your puppy. You can choose 1”, ¾”, or 5/8″ width. The single D-ring is oil rubbed for an antique look. 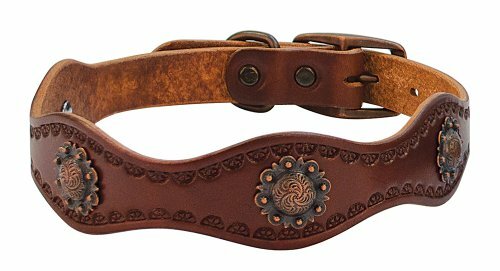 This collar is made of heavy duty Latigo leather. It’s suitable for both military and law enforcement use. This strong and durable pick is Amish-made with full-grain leather. Additionally, it’s double layered, adding to its strength. It’s designed to keep your canine safe in the field. For instance, it keeps constant pressure off the neck and spreads stress evenly. The felt inside makes it comfortable to wear. It comes with a convenient handle for easy grabbing. It comes in 3 sizes from 16”-28”. Leather has many benefits compared to cheaper-made options. Firstly, leather looks classy and stylish. Nylon dog collars don’t capture the same aesthetic as leather. Your pooch will look like his best self in leather. Moreover, they can be very comfortable when fitted properly. Other materials can cause uncomfortable rubbing. Dogs are rarely allergic to leather. Nylon and other materials can cause allergic reactions. Leather is a durable material. If it stays mostly dry, it will outlive other materials. They can be a more expensive option. However, the price can be offset if they’re well kept. Longevity is a major plus with leather. However, if your dog swims a lot they may not be for you. Leather and water don’t mix well. In this case, it never hurt to have a backup for dress-up. Look for the range of sizes. Getting the right size is essential. One one hand, too tight will be uncomfortable and could chaff. On the other, too big and it could fall off or catch on a branch. Both these situations could lead to injury. The right sized collar is snug. You’ll have enough room to easily slide two fingers under it. Measuring your dog’s neck will make the selection process easier. “Pleather” doesn’t hold up as well as authentic leather. Sometimes they will be made with some leather. This is fine if you’re on a budget. However, if you want genuine leather, don’t forget to check. It’s essential that it has the ability to endure daily wear-and-tear. This is especially true if your dog pulls. The last thing you want is for your collar to snap. If you’re walking on a sidewalk, this can be dangerous. Find a durable collar to avoid this situation. You may also want to look at heavy duty leashes. A D-ring is what you’ll attach tags and a leash to. Don’t forget to look for the number and metal quality of D-rings. For instance, with one, the leash will have to share with the tags. If this isn’t a big deal, one is fine. However, if you have lots of tags, it’s easier to have two. Many will come with two or more. Additionally, some come with plate engraving attached. This is a nice look if you’re willing to pay more. They also make slide-on pet ID tags. However, you may still want a ring for his rabies shot tag. No matter what, you should have something with information attached. His name, your address, and phone number will do. If he’s microchipped, a tag stating this is recommended. Durability of the D-ring you’ll be attaching the leash to is important. If it breaks, your dog is on the loose. Dogs get dirty. It’s in their nature. So by extension, their collars will too. That’s why being able to clean a collar is important. Most leather will be okay with soap and water. Other leather requires leather-specific cleaner. Decide on your preferences. Look at the instructions so you can appropriately clean it. 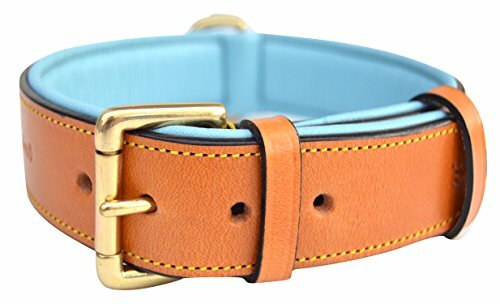 How do I know what size collar to get my dog? Answer: To get the best fit, you’ll want to measure your dog’s neck. Finding the right size is like shoe sizing. Not every brand will have identical sizing. A medium here could be a large elsewhere. Because of this, you’ll need an accurate measurement. The sizing chart will make your life much easier as it helps you compare options. How should I measure my dog’s neck size? A: A soft ruler or tape measure work well. You can also use a string and measure that with a hard ruler. If your dog is excitable and jumpy pick a relaxed time. Catch your dog while they’re just lazing around. If your dog is hesitant, coax them with food. You can also try distracting them with toys and attention. Wrap the measuring device around where the collar will sit. Always leave a little breathing room for your pet. Where the ends meet will be your measurement. Watch this video for a demonstration. 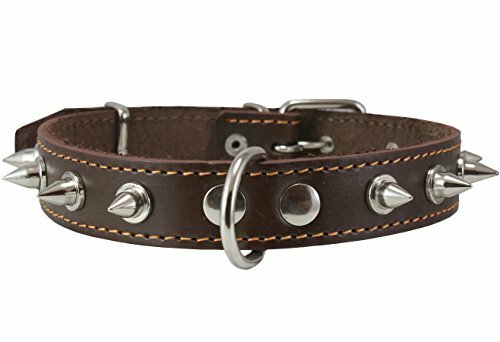 Should I buy a leather collar for my puppy? A: Large dogs that grow a lot don’t stay small long. Leather is usually more expensive. You can opt for nylon while your puppy grows. This can be a temporary stand-in until Fido is full-grown. However, if you really want the leather look, check our budget pick. How do I maintain a leather collar? A: Your leather dog collar will come with care instructions. A wipe down with soapy water will do for most. Others may require special leather cleaner. Make sure you clean it regularly, so it lasts a long time. A: Cleaning it or going for a walk in the rain is fine. Prolonged exposure to water is not recommended. For instance, you shouldn’t let your dog swim with leather on. Leather can become brittle if they become too wet. This can cause the collar to break over time. One big challenge on walks is dogs that pull. Even worse are escape artists that slide out of their collars. Martingale collars reduce the risk of your pup slipping out. Additionally, they reduce pulling tendencies. They have two loops that tighten around the neck. Because of this, you’ll have greater control. It provides gentle feedback to train for better leash behavior. Thankfully, this design is much less controversial than the prong collar. As long as you’re not yanking on the leash, it’s safe. Another training tool is the PetSafe gentle leader head collar. However, this doesn’t come in leather. 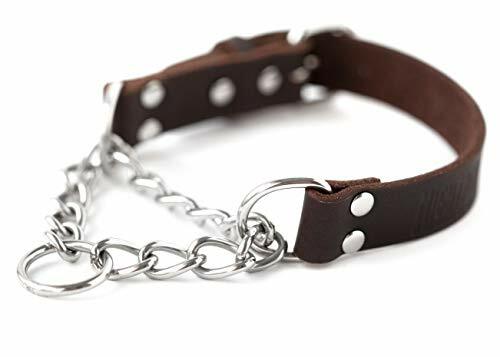 This collar is made of genuine leather and stainless steel in the USA. Stainless steel is even stronger than nickel plated metal. Also, it won’t discolor. The chain attached makes noise when pulled. This warns your dog to stop or slow down. This is the same benefit of chain collars. However, leather is much more aesthetically pleasing. This one comes in 3 sizes and fits necks 10.5”-20.5”. This leather martingale is designed with Amish-made leather. It comes in 2 sizes, from 16”-26”. It comes in both black and brown. The hardware is nickel plated and holds up well. The 1” leather band is comfortable and pliable. It’s durable leather and rates well with dog owners. Maybe you’re going for a more intimidating look. Spiked dog collars make a bold fashion statement. Many we found weren’t true leather. However, this one is made of hardy, genuine brown leather. The hardware is nickel plated and heavy duty. It comes in different sizes, but price points vary. The one featured is for medium dogs. It’s 20” long total. It can fit necks 14”-17”. We know you want the best for your furry friend. These quality leather dog collars will give you just that. With durable material, leather offer long lasting use. You know what to look for; shopping will be easy. Happy yellow, heavy duty, or high fashion– you got it. Your dog will get double-takes just walking down the street. Psst– they make a great Christmas gift for your dog!